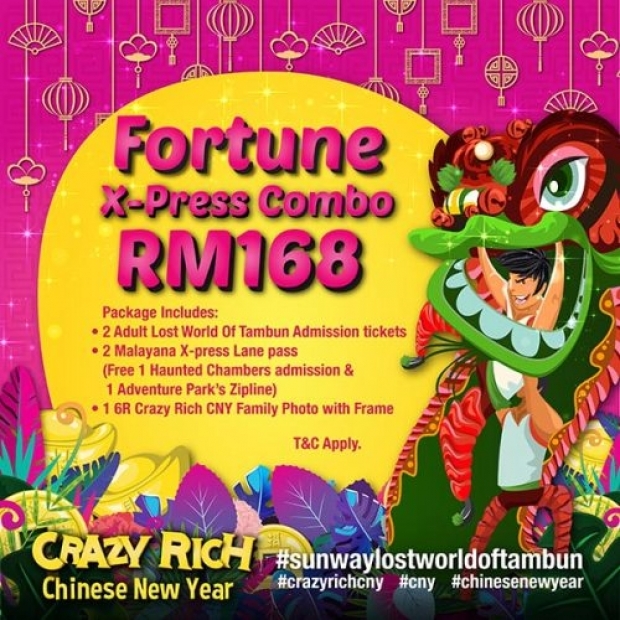 Get this Fortune X-press Combo which includes TWO (2) LWOT tickets (Adult), TWO (2) Malayana Xpress Lane passes and ONE (1) 6R Crazy Rich CNY Family Photo valid for purchase from 10 Jan 2019 – 4 February 2019. Date for Tickets Redemption: 1 February 2019 till 19 February 2019. Ticket redemption is ONLY from 1 February 2019 until 19 February 2019. Customer must produce the original e-Voucher Confirmation to redeem their admission wristband. Complimentary passes of 2 Malayana Xpress Lane Passes (inclusive of 2 Haunted Chambers tickets and 2 Zipline at Adventure Park) only valid on the redemption date. 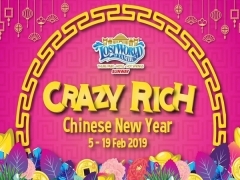 6R Crazy Rich CNY Family photo can be redeemed at Tambun Bazaar retail outlet on the redemption date. Ticket includes entry to ALL parks, including all rides, activities and attractions. Not applicable for Crystal Spa treatments and other Lost World Adventure Park activities except Zipline. This promotion is non-refundable, non-revalidation, not exchangeable for cash & not applicable to other ongoing offers, events and/or promotions will be made under any circumstances. Check out ​Sunway Lost World of Tambun for more details about this offer and to see all deals up for grabs!